You Are Here: Disney California Adventure Park » Get Your Ears On Celebration Food! 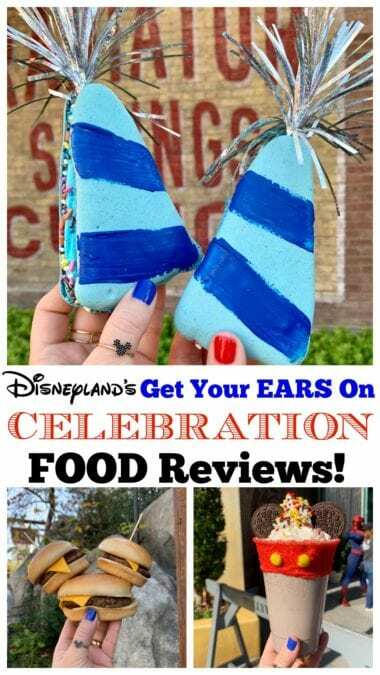 Sharing my reviews on the Get Your Ears On Celebration Food today! I got to try just about everything on the new food list and let me tell you it is FANTASTIC! Let’s talk about my favorites! The Get Your Ears On Celebration is happening now at Disneyland Parks! An end date hasn’t been announced just yet, will update when I hear specifics. You will definitely want to check out the new menu items for this celebration. I really enjoyed most of it. Scroll below to see details about each location! Until February 18th, check out the Best Valentine’s Month Food at Disneyland Park! 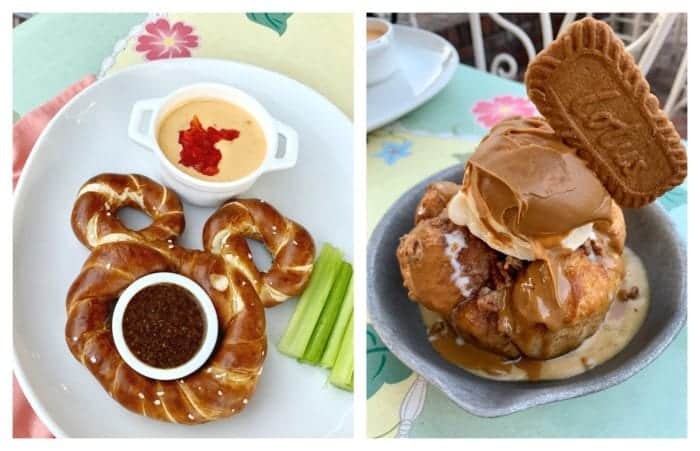 Be sure to follow Disney Hungry on Instagram for the latest BEST EATS at the Parks. 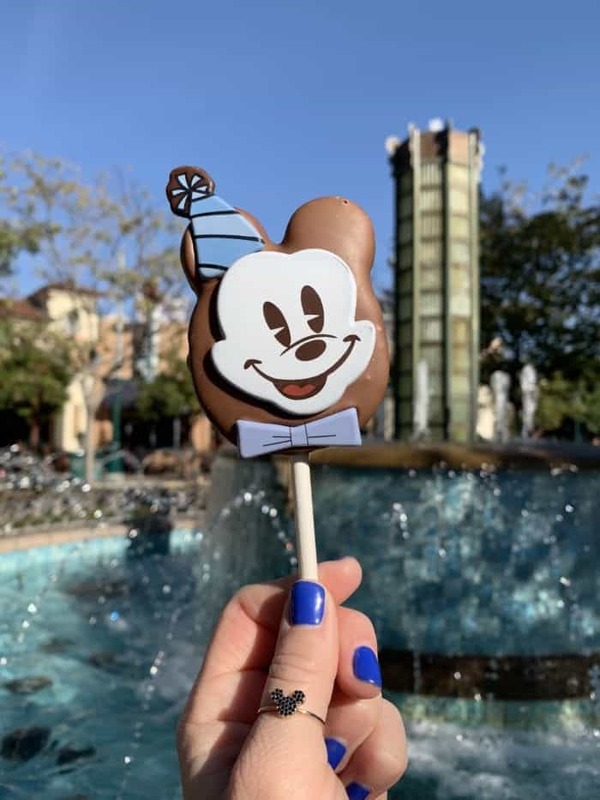 Mickey Mouse Celebration Churro – Warm chocolate churro drizzled with cookie butter topped with Mickey confetti and served with a side of red marshmallow crème and classic Mickey buttons. These are the ones in my photo above. I love the chocolate based churros. Didn’t care for the very red marshmallow cream dip. Pass on the dip….trust me. Turns EVERYTHING red. Took scrubbing my fingers pretty hard to get it off. However, two thumbs up for the chocolate churro. 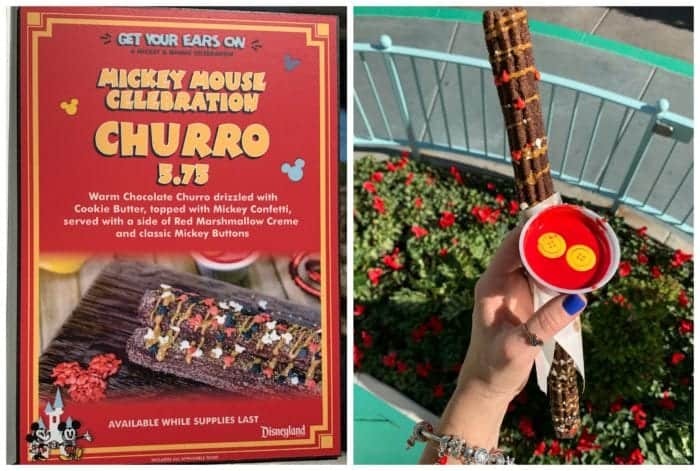 Fantasia Mickey Churro (available starting February 19)– Warm chocolate churro dusted with red and blue sugar served with a side of red marshmallow crème and Sorcerer Mickey hat. Until February 19th, you can find the Chocolate-Cinnamon Sugar-dusted Churro with spicy cocoa dipping sauce. Banana Pudding Churro (available starting February 19) – Classic churro rolled in vanilla cookie crumbles with banana pudding dipping sauce. Until February 19th, you can find the Burning Love Valentine’s Churro – Sweet and spicy red sugar churro with “double-the-love” cream cheese frosting. 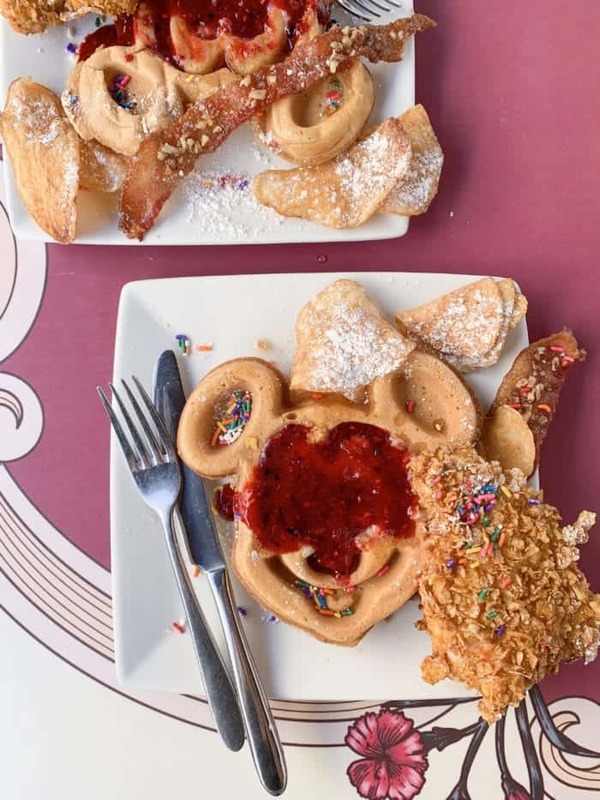 For breakfast during the Get Your Ears On Celebration you can get this “Celebrate Mickey” Chicken and Waffles (breakfast only) – Mini Mickey waffles with icing, sprinkles, and frosted cereal-crusted chicken. I really enjoyed it! The chicken needed a little salt, but other than that I enjoyed the sweet and savory combo. It doesn’t come with maple syrup so be sure to ask your server for a side of syrup. Hot Chicken and Waffles – Spicy hot chicken and a large Mickey waffle with blistered tomato and balsamic glaze. TV Dinner Pot Roast – Wagyu pot roast, blue cheese and bacon mac and cheese, sautéed green beans and carrots, and braised red cabbage served with a pineapple upside-down cake. Jolly Holiday Bakery Cafe is one of my favorite places to stop for breakfast, lunch or dinner. Their dessert case is always on point as well. 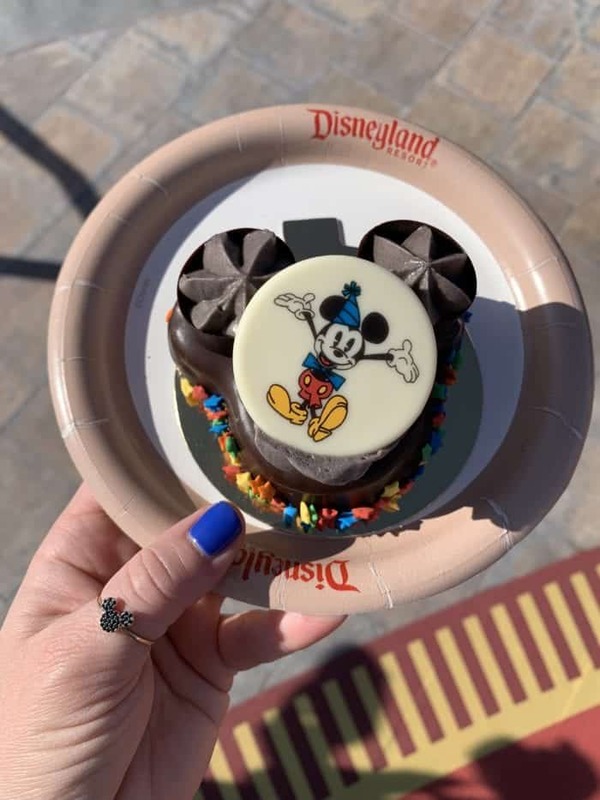 For the Get Your Ears On Celebration you can enjoy this adorable Mickey Mouse Club Hat Dessert – Chocolate truffle mousse dome with vanilla bean crème brûlée center, Mickey ears, and Mickey Mouse Club logo. This was my favorite of the desserts we sampled. Really delicious. We also tried the new Specialty Toasted Cheese Sandwich – Swiss, Jack, and Fiscalini cheddar cheese with crispy pancetta and blackberry jam. It was great. Can’t go wrong with bacon and cheeses. We ordered a side of tomato soup for dipping. 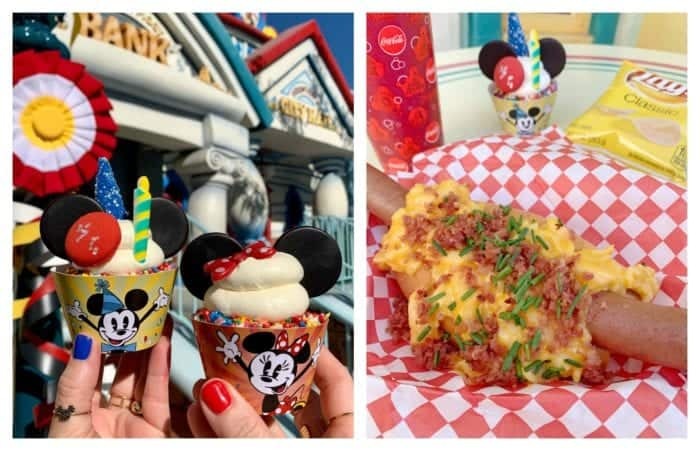 The Mickey Macaron on the right side of the photo wasn’t listed on the Celebration list, but it is also new. An adorable and delicious Macaron. Try this one too! Over at Mickey’s ToonTown, you can get these Mickey and Minnie Chocolate Chip Cookie Cupcake – Mickey’s is topped with buttercream frosting, birthday sprinkles, red glitter macaron, sugar candle, chocolate ears, and blue sprinkle cone “party hat.” Minnie’s is topped with buttercream frosting, birthday sprinkles, chocolate ears, and a red bow. At Pluto’s Dog House, you can get this Bacon Mac & Cheese Footlong Hotdog – topped with creamy bacon mac and cheese and served on an Italian roll. Other than the bun needed to be much longer to fit the dog, the mac and cheese + hot dog was actually pretty good. I’d recommend sharing with a few people. These new menu items at Cafe Orleans were some of my favorites of all of the new food! 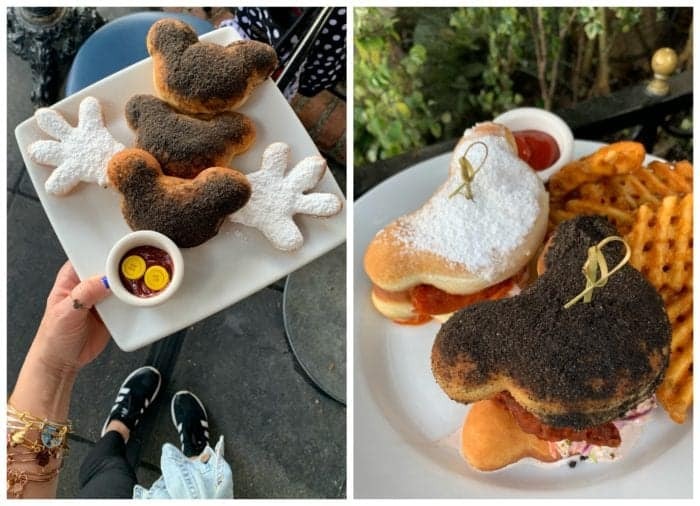 The Birthday Cake Mickey Beignets on the left side – Chocolate-coffee cake and white cake beignets. They were so soft and perfectly sweet. I didn’t get much coffee flavor, tasted more like Oreo. Came with a button topped jam for dipping. I didn’t even think it needed it. The Fried Chicken and Beignets were equally amazing – Buffalo-tossed chicken served with sugar-dusted beignets, herb bacon coleslaw, and waffle fries. Loved the spicy buffalo chicken. I found myself eating the chicken without the beignets. The waffle fries were perfectly crisp and flavorful. Another great plate to share with the table. River Belle Terrace knocked it out of the park with their new menu items. The Mickey Jumbo Pretzel, Hand-crafted Bavarian pretzel with cheese and mustard for dipping was such a perfect appetizer….not to mention so fun to photograph. The Cookie Butter Monkey Bread – covered in cookie butter and vanilla ice cream and garnished with two cookie butter cookies….literally needs no words. The addition of cookie butter was the perfect sweet touch. Definitely share this one! Caramel Corn Churro – Classic churro dusted with corn cereal sugar and topped with salted caramel and caramel corn. I really liked this churro. It’s nice and sweet with the caramel and a bit savory with the popcorn. A fun one to share! 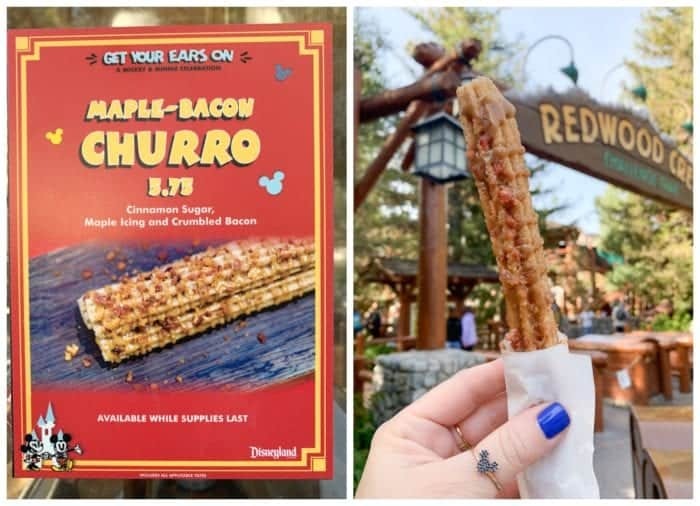 Maple-Bacon Churro – Classic churro dusted with cinnamon sugar and topped with maple icing and crumbled bacon. 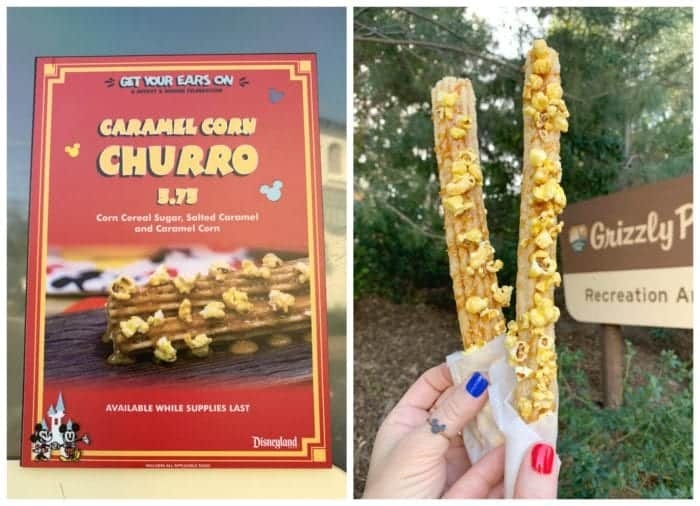 This was my favorite of the new churros at Disney California Adventure Park! Loved the combination of salty bacon and maple icing. I’d definitely recommend trying this one! Celebration Mickey Chocolate Churro – Chocolate cookie-dusted churro with chocolate icing and sprinkles. I love the chocolate based churros. Didn’t care for the very red marshmallow cream dip. Pass on the dip….trust me. Turns EVERYTHING red. Took scrubbing my fingers pretty hard to get it off. However, two thumbs up for the chocolate churro. Trolley Treats as some of the most adorable and delicious bakery items! 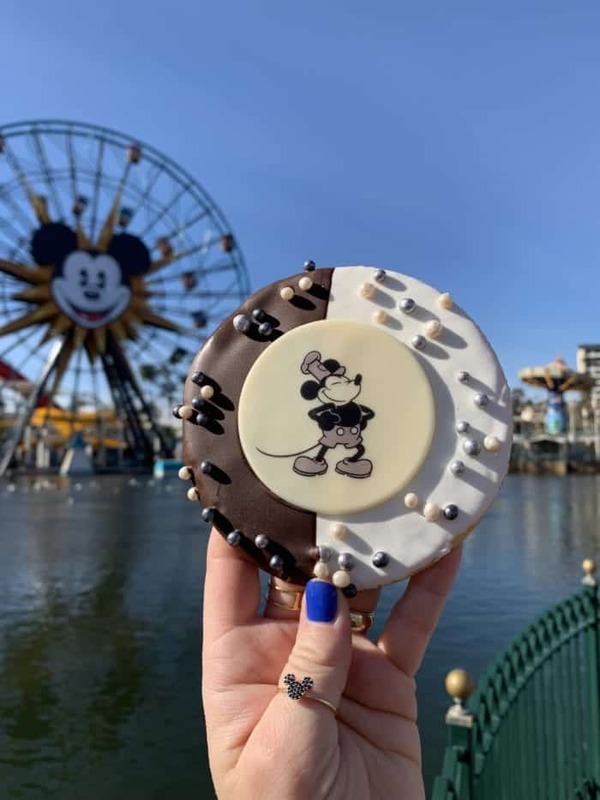 They’ve added this cute Steamboat Willie Black and White Cookie – Butter shortbread cookie dipped in white and dark chocolate with silver crunch pearls, for the Celebration. It was soft, sweet and chocolate fantastic. I recommend this one for sure. 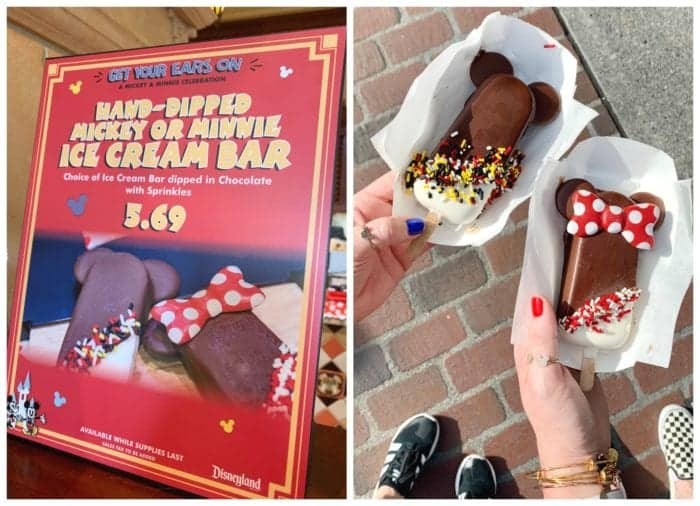 Over at Clarabelle’s you can enjoy these cute Hand-dipped Mickey or Minnie Ice Cream Bars – Choice of ice cream bar dipped in chocolate with sprinkles. I’m telling you, these are so good! The chocolate is ridiculously amazing. You won’t want to miss these perfectly sweet bars during the Celebration! 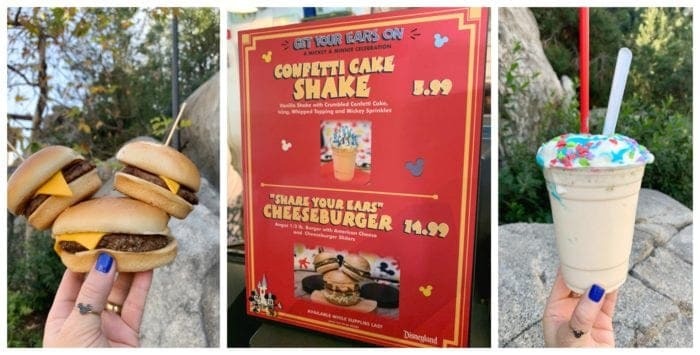 I was so excited to try these two new menu items for the celebration!! I enjoyed both. Not my favorite of all of the new food, but still enjoyed. 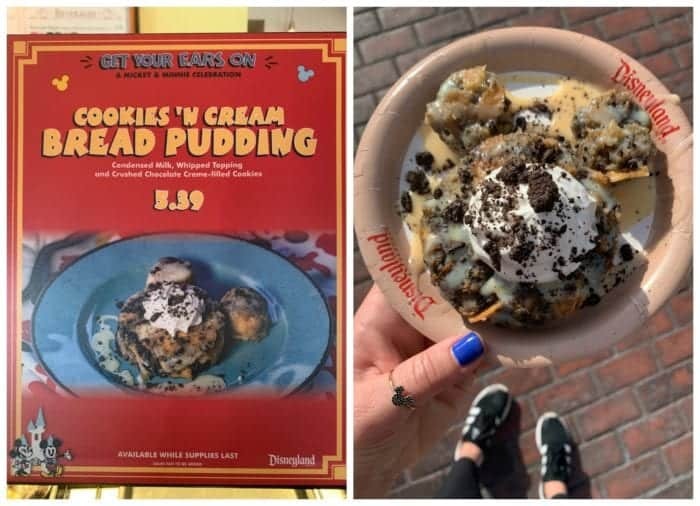 One of my very favorite new food items goes to this Cookies ‘n Cream Bread Pudding – with condensed milk, whipped cream, and crushed chocolate cream-filled cookies, It was warm, gooey, sweet and packed with crushed Oreo Cookies. Doesn’t get much better than this dessert. Share this one for sure! The cute little Gourmet Coffee Cart located right before you get to Pixar Pier has these two new cookies available for the celebration. Both were absolutely a YES for me. Sweet but not too sweet. Check them out! Over at Boardwalk Pizza & Pasta, you can get this Spectacular Mickey Pizza. 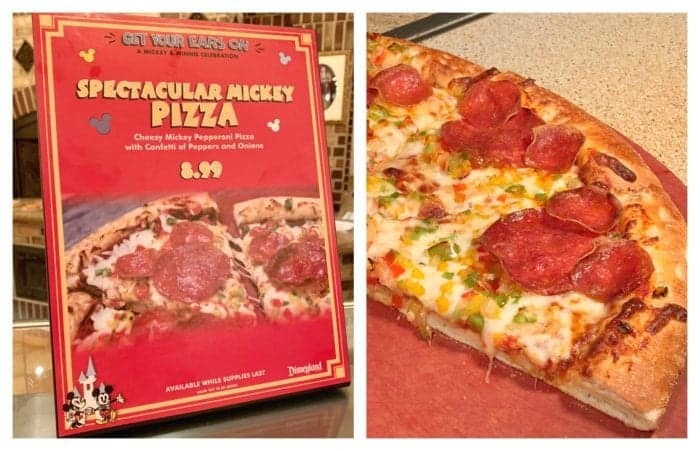 I mean, who doesn’t want a slice of pizza with Mickey shaped pepperoni? Award Wieners was sadly not serving food the one day I had to sample everything, but I’m adding it to my list, because their previous seasonal Funnel Cake Fries and dogs never disappoint! Be sure to check them out in Hollywood Land when you need a quick bite to eat! Schmoozies is always a favorite to pick up the fun new seasonal food items. 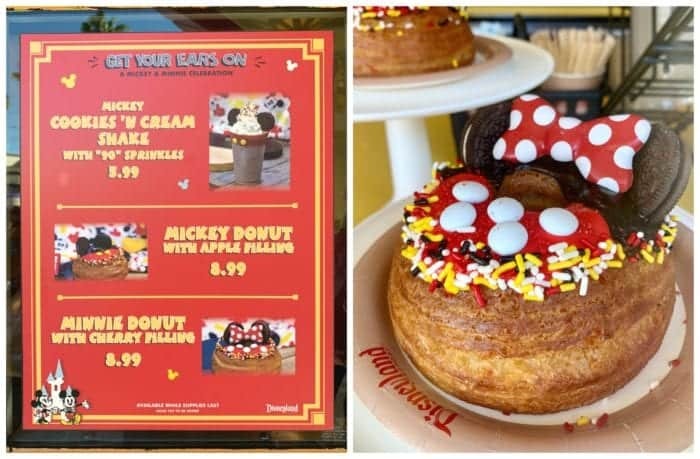 They knocked it out of the park for the Celebration with their Mickey and Minnie Cronut-Style Donuts! 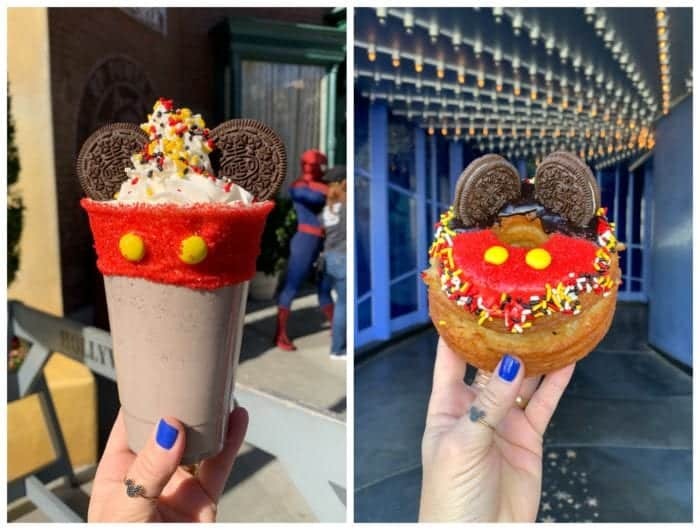 I mean, look at this Mickey Cookies n’ Cream Shake?! It was one of my favorites of the day. Donuts are always good. They’re huge so be sure to share! 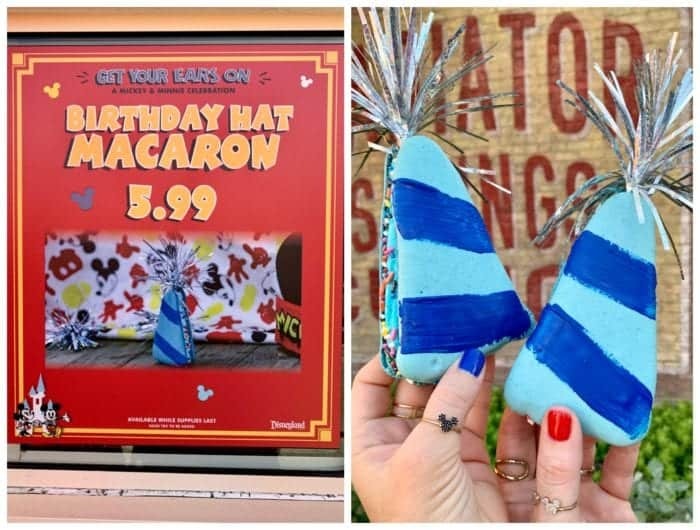 Cars Land’s Cozy Cone Motel has this Birthday Hat Macron that could not be more adorable!! It’s Cotton Candy flavored and when you break it open, a sea of sprinkles come falling out. It’s super fun and perfectly sweet. Another I would recommend sharing with the group. Enjoy! Super Cute! So much fun to see everything they come up with when being in the office and not the park.